is a psychotherapeutic approach applicable to those who wish to work in an embodied way, exploring the body-mind connection. Beneficial especially for those experiencing anxiety, acute stress and stress related illnesses. emphasises therapeutic process in the context of a contained group, & facilitates therapeutic meditation in an accessible format. The Four Elements DMTM has been an ongoing development in the clinical practice of Katarina Gadjanski BSc (Hons) Dip Psych UKCP since 2009. The work has largely concentrated around clients who have suffered from early life trauma and Post Traumatic Stress Disorder, as well as those with stress related illnesses and mood disorders. Katarina found that talking therapy had limited success when dealing with these clients – in particular those with trauma or psychosomatic disorders. It became apparent that their bodies were still holding undischarged emotional content, and so talking psychotherapy offered limited progress – the body needed to be accessed in order to find its expression as well. Katarina therefore turned to the work of Dr. Peter Levine, the foremost expert in trauma and the body, and began integrating his Somatic Experiencing methodology into her work. This body-oriented form of therapy greatly benefited her clients, and so she has continued to explore other ways of addressing that which is held at the somatic level of being. Simultaneously, Katarina was using mindfulness meditation with clients who suffered from depression and anxiety, which brought a relief to many. As she continued to practice various forms of meditation over the past 20 years, she was particularly interested in how one might bring the therapeutic elements of meditation into psychotherapeutic work. 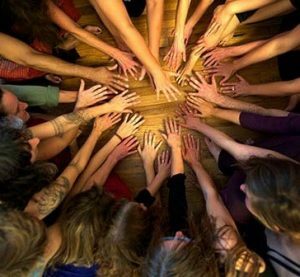 Additionally, Katarina was most interested in bringing free form therapeutic dance and movement meditation into this body of work, that being the practice she personally found most helpful at many challenging times in her life. She discovered that free expression through movement and dance offered clients a great platform to explore themselves in a new connected way (body, mind and emotion) and to evolve from processing verbally and conceptually, to experiencing a more integrated self awareness. Thus gradually integrating these varied models, Katarina brought her original Transpersonal Psychotherapy training together with her experience in Body-Psychotherapy, mindfulness meditation and dance & movement – and Four Elements Dance and Movement Therapeutic Method was born. 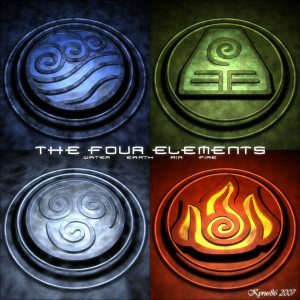 We use the Four Elements Transpersonal model (incorporating Earth, Water, Air and Fire) by integrating elemental visualisations and creative imagination with four elements music. In helping people to connect with these four outer elements, they are encouraged incrementally to re-connect with the inner landscapes: Earth = Body, Water = Emotions, Air = Mind and Fire = Energy. As they explore and move through these four aspects of themselves, various techniques are utilised to process and release emotion, blockages and constriction that are held within the body-mind. This process frees the participants to connect with the Transpersonal Element – Aether, and help them re-connect with pure consciousness. The result of reconnecting with this fifth element is a sense of openness, inner peace, stillness and a feeling of oneness. We use Somatic Experiencing and various body-psychotherapy techniques when working with the body. This facilitates release of trauma, constriction, pain or any other uncomfortable sensations that the body may be holding due to un-discharged traumatic material. 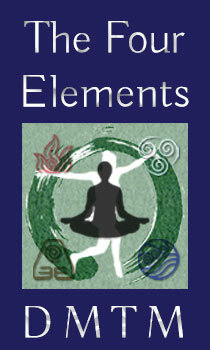 We also work with the four elements within the body itself. The Earth element represents the structural body (muscles, bones & joints), the Water element represents the blood flow and bodily fluids, the Air element represents breath, and the Fire element represents the vital heat and kinetic energy of the body. The third integral component of this work is based on emotional expression interpreted through dance and movement. In this work we use carefully selected music, based on the four elements, to guide participants into connecting with each element (Earth, Water, Air & Fire) and concomitant aspect of themselves. In this practice, the body and movement itself, becomes an object of meditation. The purpose is to shift energetic and physical blockages through conscious movement, and free expression through dance. As we gradually move through every element (beginning with Earth and ending with Fire) we free our mind, body and heart and start to re-connect with our higher consciousness. Extensive clinical research shows the profound therapeutic benefit of using mindfulness in the treatment of depression, anxiety and stress related dis-eases. Katarina has gone back to the source of mindfulness practice, incorporating the Buddhist Four Foundations of Mindfulness into the Four Elements practice. She has found that these two models correlate synergistically. We start with the mindfulness of body (Earth), move to the mindfulness of feelings (Water), mindfulness of breathing (Air) and finish with mindfulness of the mental formation (Air/Fire). This Mindfulness practice, interwoven with The Four Elements, is used to help participants return back to the present moment. This grounds any predisposition to dwell negatively in the past or future, and root participants firmly in the here and now. All of the above methodology is facilitated within the contained space of a therapeutic group. Setting up and holding this field, or safe container, is an integral part of the Four Elements DMTM. This non-judgemental group environment is set up by using confidentiality and respecting therapeutic boundaries. Sharing and mutual support is encouraged through working as a group, in pairs, as well as individual work. Anyone who would like to experience psychotherapeutic benefits of this therapeutic approach and be part of a supportive group/community. Those who might not otherwise turn to meditation, body-psychotherapy or dance & movement practice but would like to experience the therapeutic relief it brings, especially when it comes to management of stress, anxiety, depression and stress related illnesses. Those who tend to ignore, disconnect or dissociate from their body. Note that there is an inherent danger with ungrounded meditation or uncontained dance and movement practices, such that difficult and unconscious issues are bypassed by “transcending” or leaving the body, along with the unconscious (Shadow) thus “escaping” into a spiritual realm. 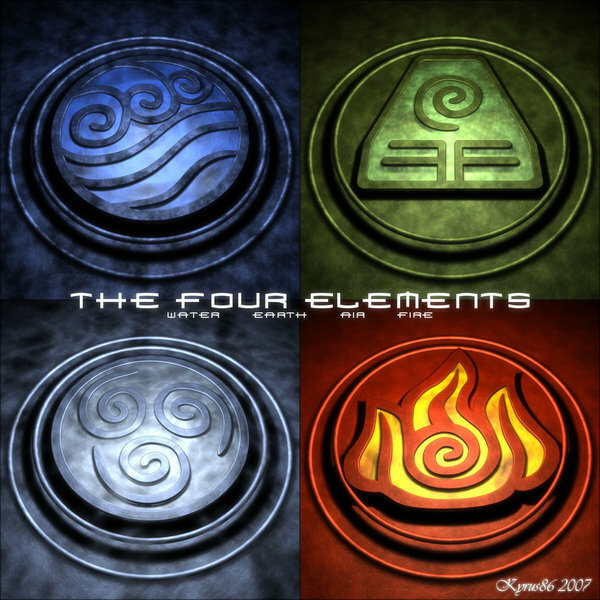 Four Elements DMTM addresses this by rooting and deepening anyone’s practice, exploring and integrating the unconscious processes stored in the body.